While at Macworld, I usually pick one product I simply can't wait to try until I get home. When I saw Serene Saver, I knew it would be the product I'd try that very night. The booth's location was in the "low rent district" as I like to call it. These are small kiosks usually staffed by the writer of the software. There aren't sales people or flashy presentations because there isn't any room. The quality of the product needs to stand on it's own and Serene Saver doesn't disappoint. Of course, when I saw "Serene Saver", I immediately remembered the Seinfeld episode of a similar name. Ironically, that episode was inspired by "The Net" which was filmed at a Macworld Expo I was at. You know that one episode of Family Guy where Peter makes some seemingly random reference to something that connects him to Generation X'ers and then the sketch goes on for too long. You don't quite get the reference, it's bearing to the story, or why Fox didn't let sleeping dogs lie. Oh yeah, that's pretty much every episode. However, this reference to pop culture does actually have some bearing on my review of "The iPhone Book". This was a series of disjointed short "tips" about the iPhone that included way too many pop culture references that made you scratch your head and want to put on Futurama instead. The book was cowritten by Scott Kelby and Terry White and their styles mixed like oil and doorknobs. In the intro the authors warn the book is "quirky. ", and if you want "quirky" buy this book. 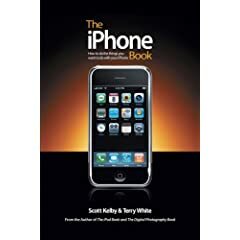 If you want a great book on how to use your iPhone, put this book back on the shelf.